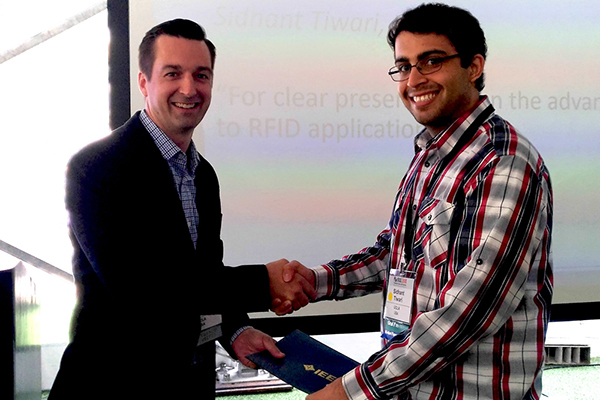 TANMS doctoral student, Sidhant Tiwari, has received the Best Student Paper Award in the Sensor and Transducers group at the 2018 IEEE International Frequency Control Symposium held in Olympic Valley, CA. His presented work, “Frequency Doubling in Wirelessly Actuated Multiferroic MEMS Cantilevers” demonstrates how nonlinear multiferroic coupling can be used to measure multiferroic antennas without noise, the first ever demonstration of this technique. Sidhant is a fifth year Ph.D. candidate and a member of the Sensor and Technology Laboratory, working under Professor Robert Candler of the Electrical & Computer Engineering Department. His research focuses on studying the dynamics of multiferroic coupling and applying it to the design of a high efficiency chip-scale radio frequency devices, such as antennas.